Post subject: How to install games for use? I just installed Basilisk II for my Windows 10. It opens fine and runs. I have no idea how to put game software onto this emulator. Perhaps it is very simple but it is not immediately apparent to me specifically. If anyone could help me on this matter, it would be most appreciated. I have the game .sit file downloaded. Post subject: Re: How to install games for use? On Windows hosts, .sit files are best inflated with Stuffit Expander on the Macs emulated "hard drive". There are a fewStuffit versions hosted at MacintoshGarden, IIRC version 5 was the last 68k one matching Basilisk II. If you come across a sit file that refuses to open with Stuffit 5, let me know. I did add zipped img game files for emulators at MacintoshGarden from time to time. Ok, I see where stuffit is on the Mac emulator while it's running. How do I get my .sit file onto the mac 'hardrive'? Using either the shared folder which should show up as a separate drive on the desktop, or via network connectivity after enabling that in BII. Note that BII won't show the shared folder if you're using 7.1 or earlier; if you use 7.5.3, it should show up if you've got it configured. you can also use HFV Explorer to create and open a disk image, copy stuff onto that, and then add the disk image to your disk list for the emulator. This probably ins't the correct thread, but I see you're very knowledgeable and helpful and I was wondering if you can help me to install a game on my MacOS. I setup the emulator just fine and downloaded the 2 .sit files for Titanic: Adventure in Time and put them in my shared folder, along with Stuffit. I moved Stuffit and Titanic1.sit onto the other hard drive (MacOS753), installed Stuffit, but Titanic2.sit is too large to fit with those files as I set the MacOS753 to a max of 1000mb per instructions. I tried unpacking Titanic1.sit for now but clicking on it or dropping in on top of Stuffit, yields no results. Got any ideas? You can probably get away with a much larger virtual disk; 13GB should be enough for anything. Smaller disk sizes are just for when people are having problems with the larger ones -- but the problem is usually with the way the disk is formatted, not its size (unless you're doing terabytes). Hi, also a bit late, but related. I have the game's (Dr Health'nsteins Body Fun) .sit file unpacked on Basilisk. I found it in my my files through "This PC". "The Document "BodyFun.img" could no be opened, because the application "Disk Copy" could not be found. Could not find a translation extension with appropriate translators." I can't work out what to do, so any help would be greatly appreciated. 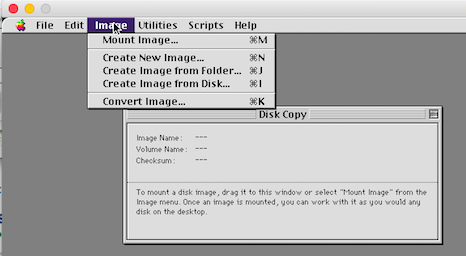 You need to install Disk Copy 4.2 on your BII image, *or* mount the file inside the .sit as a disk image in BII Prefs. I tried using HFV explorer to make a .hfv.dsk and then used the BII gui to mount it. It still came up with the same error. How would I use Disk Copy 4.2 to do it? From my limited experience DC 4.2 may work with emulators - or not. After inflating, mounting and moving DC6 to your Utilities folder or a place of your choice, images may be mounted from Mac volumes by double clicking. In case the resource fork of a .img was lost or damaged, the img can usually still be opened from the menu. I downloaded and installed Disk copy 6, then mounted my Body Fun.img. It opened a folder with all the files inside. I double clicked it to run, and it says "Can't find BODYFUN CD-ROM. Please place it in your CD-ROM drive and try again"
Sorry for this, I'm a bit new. Many games do look whether the according CD_ROM is inserted into your Mac´s CD drive. For some games there is a hack aka no-CD-patch. That way many games can be fooled into thinking the game CD is there. I´ll give http://macintoshgarden.org/games/dr-hea ... s-body-fun a whirl with SheepShaver and will report back. Last edited by 24bit on Sun Aug 19, 2018 9:33 pm, edited 1 time in total. Thanks very much! Unfortunately I don't have the CD, I got it from the link you posted. It's frustrating because I feel like I'm so close! The IMG is just fine to play the game, just mount it with the app I pointed to. You may also use the second DL with the zipped CDR, either way should be OK. In any case, the img/cdr must reside on the emulated Mac volume to let the mounter do its thing. So I gave it a DL, and used the virtual CD/DVD-ROM utility to mount the body fun.img. I now get the error "there are insufficient system resources to mount this image". Are there some settings I need to change in the BII GUI? I came across that error too, occasionally. Please double check the CDR or IMG is on your emulated Mac volume and that there is enough room. Don´t try to mount anything from the shared folder (Unix or This PC) nor from the Mac Desktop. Other than that, try running the game with SheepShaver - same mounting procedure. From my experience many 68k only apps do work even better there. The built in Apple 68k dynamic recompilation emulator still does a great job.